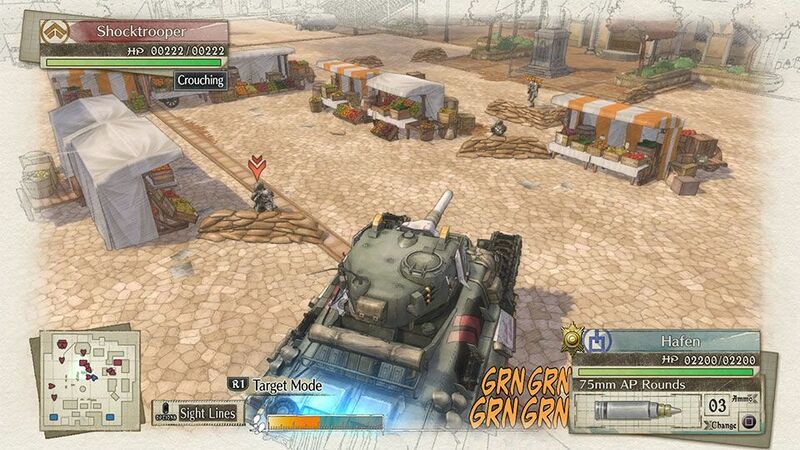 When it first came out a decade ago, Valkyria Chronicles came off as a delightfully odd duck: a sort of doe-eyed strategy JRPG that gave the Western-dominated strategy genre a much-needed taste of pastel anime charm. But its hybrid of third-person movement with turn-based tactics was relegated to consoles until a PC release in 2016. 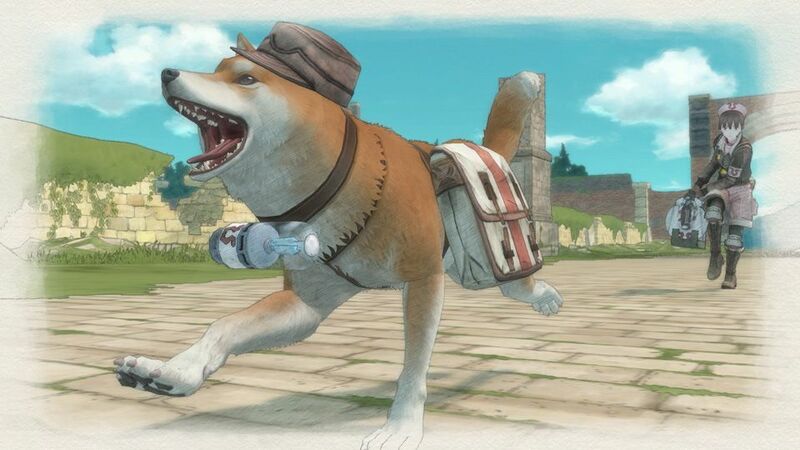 Now, for better or worse, Valkyria Chronicles 4 offers a grand return to the grounded militarized milieu that fans of the original know and love, outfitted with many of the same strengths, but with many of the same foibles riding on the underside. In this sense, it often comes off as a incremental sequel – a Valkyria 2 for the people that never played the actual Valkyria 2 – rather than the fourth iteration of that wonderful core idea. 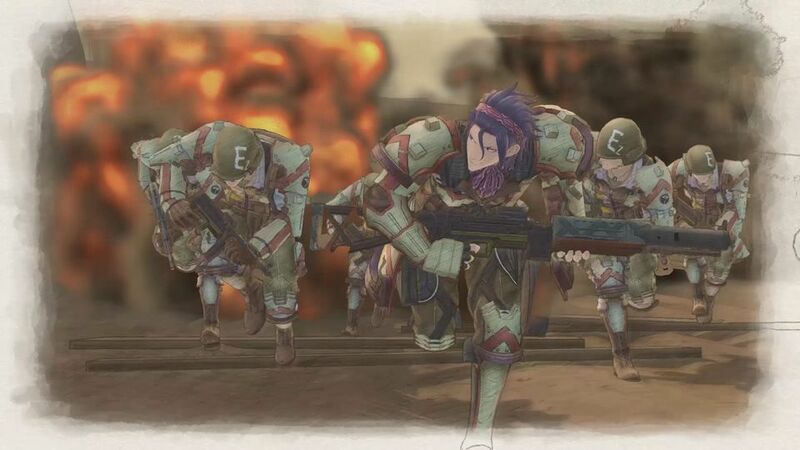 Much like the original, Valkyria Chronicles 4 chronicles (hur hur) the gung-ho exploits of a gaggle of twentysomethings known as Squad E, who fight for the Atlantic Federation against the Imperial Alliance in a lightly fantastical take on World War II. As the story opens and the troops take to the trail, a menagerie of anime tropes (the insecure commander Claude Wallace, the rambunctious hellion Raz, the reticent sniper Kai) comes off as a bit stolid and weightless, with little to guide these characters other than the requisite bombed-out hometown they all share, along with a smattering of mild xenophobia. After they stumble a few times on the warpath, however, the fires of adversity forge them into better versions of themselves, and I began to savour the lively inter-mission chatter between the leads much more than I anticipated. For the opening few hours, I despised Raz for his lecherous banter and penchant for running headlong into enemy gunfire, but over the course of the campaign, he grew enough as a character to bring me back around – a rare feat in games. This sense of overriding familiarity extends to the battlefield itself, which retains much of the look and feel of the original, even down to the dramatic cutscene that plays when you issue an order. Anyone hankering for the clockwork grand-scheming of a Total War will be left cold here, as the skirmishes between your Federation and their Imperial foes are mostly small-scale affairs. Though you may occasionally direct a battalion of tanks, the objectives usually boil down to a constellation of typical bullet-points – capturing the enemy’s base camp, eliminating a particular threat, or clearing the board of all enemy troops. With the right setup, you can easily clinch most battles in five turns or less through the deft manipulation of perhaps half-a-dozen competent soldiers and a tank. Troops are stratified into two major groups: characters core to the plot are dubbed “leaders,” and they each grant you one more action to use on each of your turns, while typical soldiers just fill out your empty slots. There’s a push-pull, however: if your leaders go down, you lose that additional Command Point (the points that let you dole out orders) which can hamper your strategy late in an encounter. The soldiers of Squad E are the stars of the show here, and the game takes great pains to grant each and every squad member a meaningful (if generic) personality in and out of cutscenes – a degenerate gambler, a grizzled mercenary. It’s a shading-in of characters reminiscent of the Persona series’ Social Links. In battle, this largely manifests through “Potentials”. These are characteristics that reflect the strengths and weaknesses of that soldier. 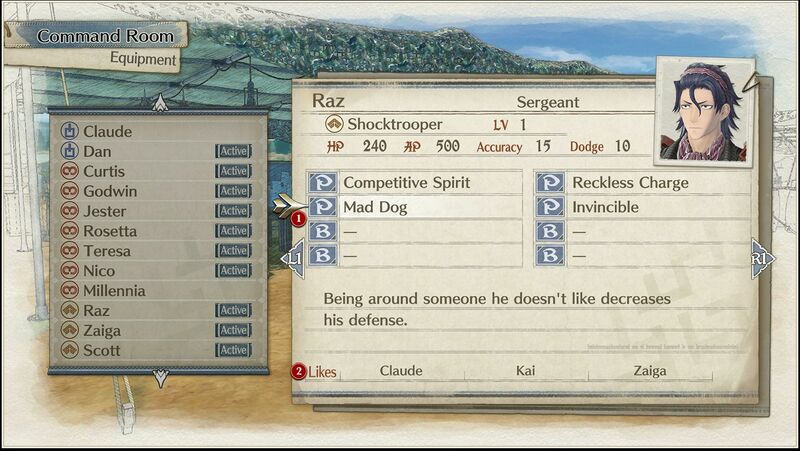 For example, the overly-enthusiastic Raz gets a demerit to evasion when he charges too far ahead of his allies, but he gains a bonus to every stat when he falls below half-health, which makes him especially suitable for those last-second solo flag captures. These abilities even extend to plot developments. When a certain love interest finally accepts Claude’s leadership, she no-longer suffers a penalty to accuracy when she’s around him. Though these quirks of personality do much to sew together the vicissitudes of wartime melodrama, told through cutscenes and endless battlefields for you to clear, the fact that these abilities are randomly-triggered saps them of much of their potential tactical benefit. Taken altogether, it’s easy to see how this brief blueprint would add up to a superb experience. 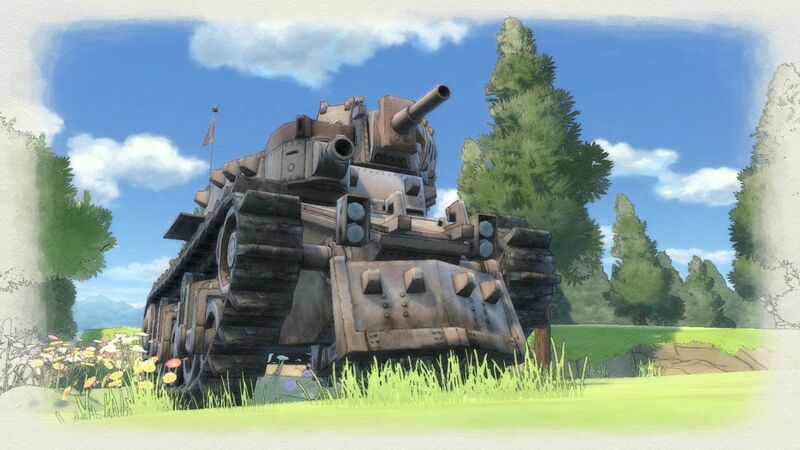 However, though I tremendously enjoy the fusion of the surprisingly-endearing plot with the satisfying crunch of its micro-tactics, I’m still not sure if Valkyria Chronicles 4 is actually a well-designed strategy game. It’s certainly a fun one, but there are several long-lurking issues that underlie the basic structure that I feel Sega should’ve weeded out by now. 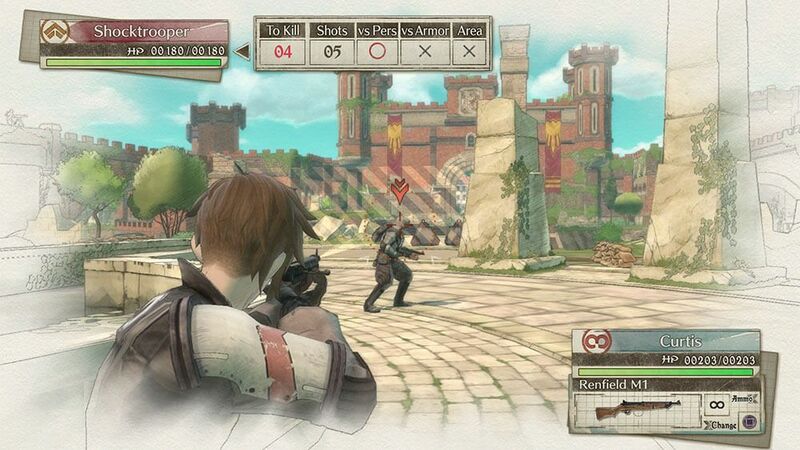 In certain circles, the original Valkyria Chronicles has a reputation as an game rife with exploits and overpowered strategies. Most of them involve buffing the Scout character class to the point of near-imperviousness and simply abusing their mobility to capture the enemy’s base camp as quickly as possible, often to comic effect. While this sequel generally rewards a more holistic approach to battle by snuffing out some of the more notorious cheese, its additions to the armory present their own complications. I’m no tactical wunderkind, but for my money, the fact that the new Grenadier class can arc their ordnance to hit the Massive Glowing Weakspot™ on the back of every tank from pretty much any angle renders the classic Panzerfaust-toting Lancers almost completely useless, except perhaps as bullet-sponges against antipersonnel fire. Similarly, the introduction of an APC with incredible mobility, no weak point, and a high-powered machinegun left my protagonist’s slow, ponderous tank feeling like a relic. I even felt myself getting annoyed when the game would make me use it for a handful of assignments. I beat maybe a half-dozen of the game’s 30 missions by loading a Shocktrooper and a Grenadier into the APC and trudging forth, blowing away everything with the mounted gun, and deploying my two passengers to take out their anti-armor capabilities. However, once facing some of the game’s stiffer challenges (especially the latter-game “elite” soldiers, who boast more health and extremely powerful ‘overwatch’ fire) I found myself relishing in these “cheap” strategies that I had convinced myself to avoid. 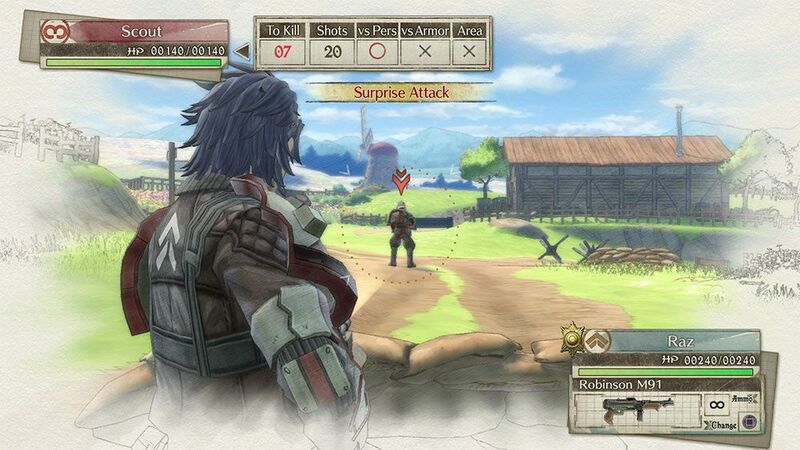 More than any of these minor quibbles, Valkyria suffers gravely from its retrograde approach to difficulty, which hides both the enemy’s powerful bosses and your own much-needed backup behind arbitrary turn counts or invisible tripwires that trigger climactic cutscenes. 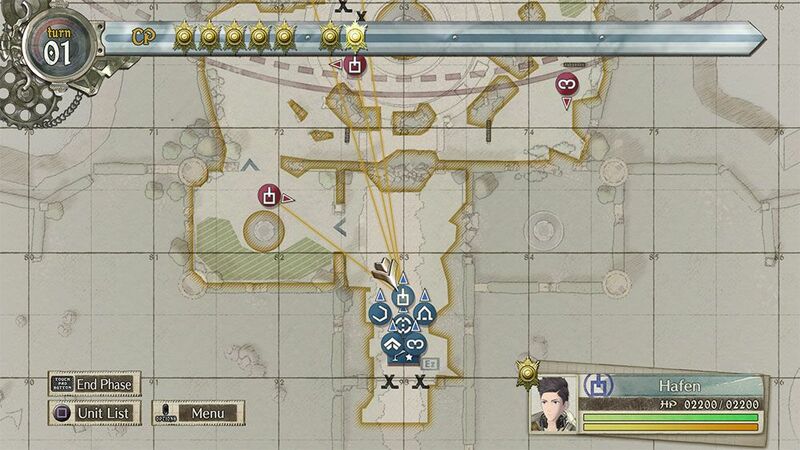 Often, I found myself developing grand battleplans three turns in advance, only for them to be blown up by some plot contrivance, or an ill-considered attempt to “raise the stakes.” Perhaps I’m just particularly attuned to this, but, if Valkyria wants to challenge you, I’d prefer it give me a fair shot, rather than pulling dirty tricks and making me reload two turns back – especially when that trick is an Anime Witch with infinite, instant-kill area-of-effect attacks. On balance, though, when I finally triumphed over these odds, I found myself thoroughly enjoying the rollicking tale of Squad E vs. the Crypto-Nazis. Like the original before it, this is an enthralling game that occupies a very specific niche – one certainly worth delving into, as long as you have the stomach for its niggling imperfections. 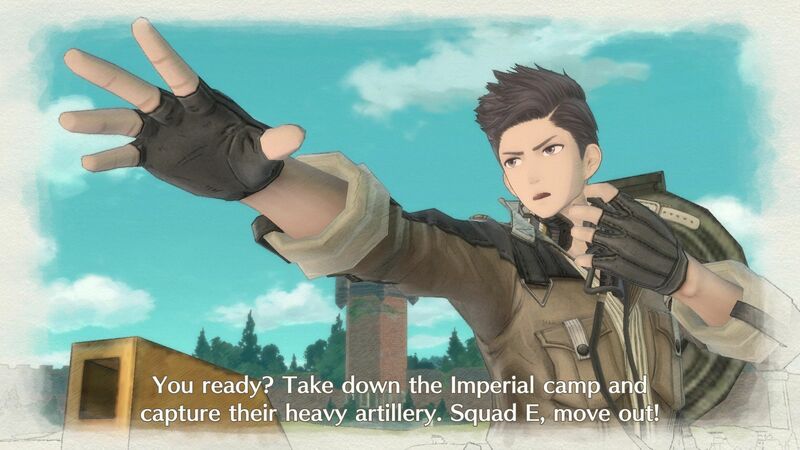 Here’s hoping that Valkyria 5 takes a long look at the arc of its franchise and makes a few more adjustments before they roll back out onto the battlefield. Personally, I’m hoping for Valkyria Vietnam. 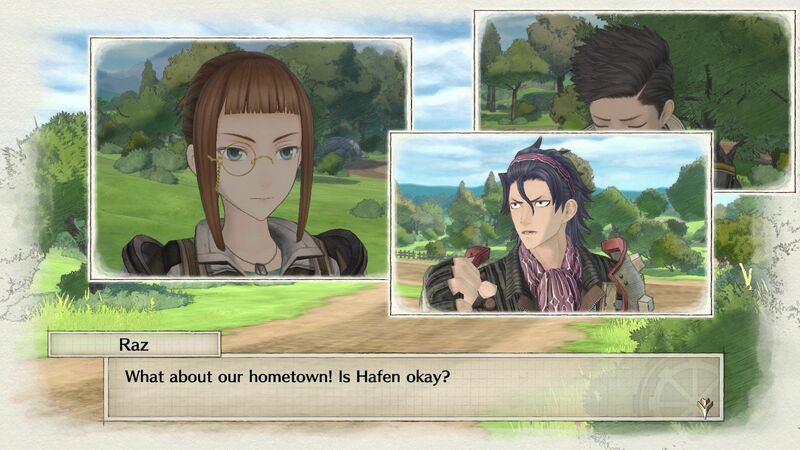 Tagged with feature, review, Sega, Valkyria Chronicles 4.